Blue Mountain, VK3/ VS-015 was my first summit for Sunday, 8th September, 2013. Blue Mountain is located in the Pyrenees Ranges, about 50 km north west of Ararat, and about 212 km north west of Melbourne. Blue Mountain is 772 metres above sea level, and is worth 1 SOTA point. The Pyrenees Ranges are situated between St Arnaud in the north, Beaufort in the south, Maryborough in the east and Stawell in the west. A number of wineries are located in the area. The Jajowurrong people were the first to occupy the Pyrenees and called the area ‘Peerick’. The explorer and surveyor Major Thomas Mitchell was the first European recorded to have traveled through the district during his 1836 journey of exploration. The ranges reminded him of the Pyrenees mountains in Europe where he had served as an army officer, hence the name he gave them. 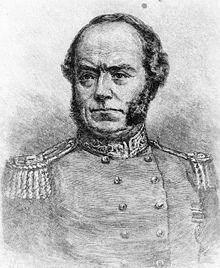 Mitchell found the area more temperate in climate and better watered than inland New South Wales, and he encouraged settlers to take up land in the region he described as “Australia Felix”. The more I travelled around western Victoria, the more I was reminded of the significant contribution that Mitchell made during the early years of Australian exploration. Following Mitchell, came the pastoralists to the Pyrenees, and this was followed by the discovery of gold in 1854. The foothills of the Pyrenees contain numerous relics from the gold mining era, with mining holes and other relics still visible today. Slate quarrying also occurred, with material obtained being used to pave the footpaths of Melbourne. During the 1840’s timber harvesting commenced to supply the growing communities surrounding the forest. After an early start and a stop at the Ararat bakery, I started driving out of Ararat. The morning was absolutely freezing cold, and there was a thick blanket of low lying fog. My drive out of Ararat took me passed the old J Ward, the prison for the criminally insane, which is no longer in use and now serves as a museum. I have been for a tour through J Ward previously with my wife, and it is very interesting and well worth a visit. I drove out of Ararat north east along the Pyrenees Highway and then turned left onto the Elmhurst-Landsborough Road to travel north. There is a large brown sign here saying ‘Pyrenees Ranges’. After about 9 km, I then turned right onto the Glenlofty-Warrenmang Road, which is a dirt road in good condition. This road is well signposted and also has ‘Warrenmang 16’ and ‘Moonambel 29’ on it. This took me passed farming land and eventually into the Pyrenees State Forest. 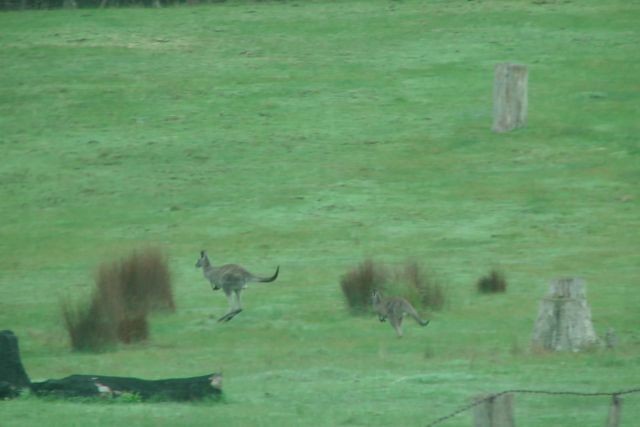 There were plenty of kangaroos out here, so in some parts it was slow going on the roads. After travelling about 5 km along this road, you reach a sharp right hand bend, and there is a track off to the left called Blue Mountain Track. The track is very rough in parts, but it is passable in a 2wd vehicle with care. 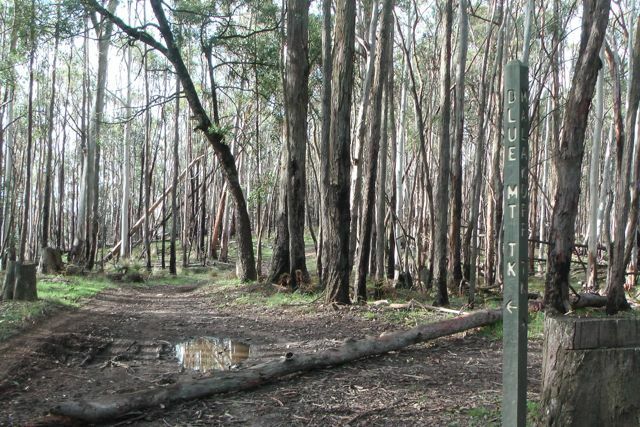 It takes you into the Landsborough Flora and Fauna Reserve. I continued on as far as I could go on the track until it got too rough for my Ford Falcon. This was near the intersection of the Blue Mountain Track and Malakoff Track. Take care if you are going to tackle this track in your car as there are large pot holes and wash aways, and there was a significant amount of tree debris and branches over the road. So I ended up walking about 1 km further along the Blue Mountain Track to the summit. 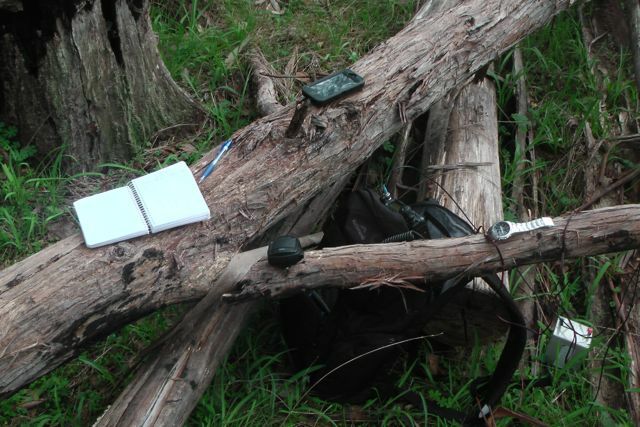 At the summit I found a nice big fallen tree which served as a seat, desk, and support for the 7m squid pole. 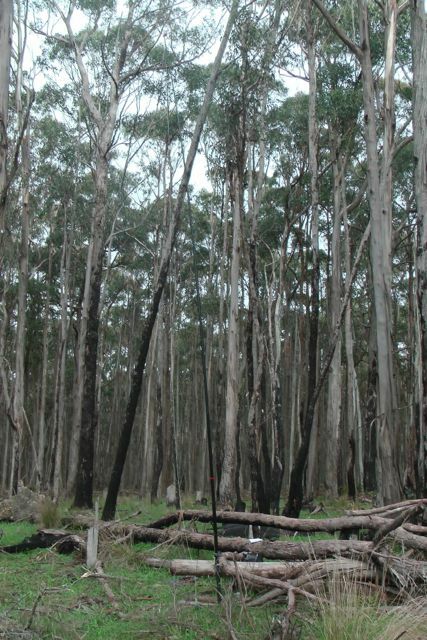 The stringybark, blue gum, & messmate forest was alive with birds (of the feathered variety !). I saw and heard quite a few Kookaburras laughing away in the treetops, along with a large number of very colourful Superb Fairy wrens. In fact about 100 species of birds have been recorded in the Pyrenees. There is also a large amount of wildlife including kangaroos, wallabies, possums, and echidnas, and a variety of reptiles including legless lizards, Bearded Dragons and Goannas. 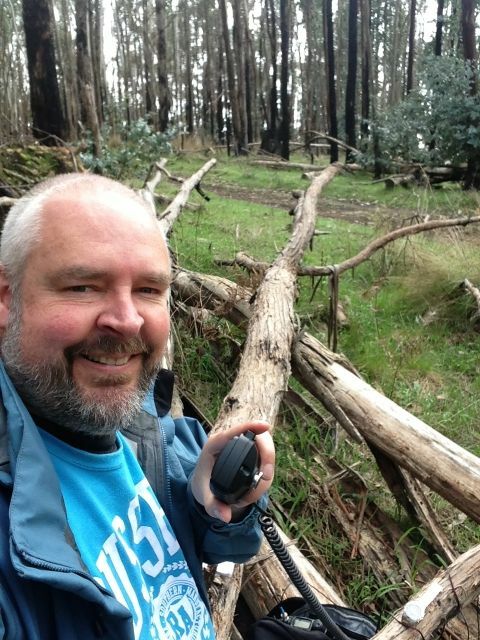 My first three contacts on the mountain, were ‘Summit to Summit’ QSO’s with Andrew VK1DA and Andrew VK1NAM, who were doing a dual activation on Pheasant Hill, VK1/ AC-021. Signal reports of 5/8 were exchanged both ways. Next was Ed VK2JI who was on the top of Canoelands Ridge, VK2/ SY-001 with a good strong 5/8 signal. I then QSY’d to 7.100 and put out a SOTA call, and was swamped by Chasers. My fourth qualifying contact was with Colin VK3UBY in Mildura who had his normal booming signal. I had a few QRP callers including Andrew VK3ARR, Brent VK2MEV, and Mitch VK3FMDV. All of whom had very nice signals. Prior to the UTC rollover I also spoke with Al VK1RX who was on South Black Range, VK2/ ST-006. Al had a good strong 5/8 signal, with a 5/9 report received from Al. My first QSO after the UTC rollover was with Peter VK3YE who was pedestrian mobile on the beach near Melbourne, using his hand held magnetic loop antenna. Peter was a good 5/5 signal, with 5/6 being received in return. I then spoke with Marshall VK3MRG who was portable on Bill Head, VK3/ VN-004, and this was followed by Peter VK3PF who was on top of Dijbalara/Asses Ears, VK3/ VW-011, in the Grampians National Park. A few QSO’s later I managed another ‘Summit to Summit’ QSO, this time with Ed VK2JI, who was portable on VK2/ SY-001, and then Al VK1RX on VK2/ ST-006, and then Andrew VK1DA and VK1NAM who were both portable on VK1/ AC-021. It was great to bag a few more Summit to Summits. Again I had a number of good QRP contacts with Tony VK3CAT using just 1 watt, Bernard VK3AMB, John VK5NJ, and Greg VK2FGJW in the Blue Mountains on just 5 watts. Again, all just as easy to copy as those calling in running 400 watts. I ended up with a total of 56 QSO’s after about 90 minutes on the summit. Andrew VK1DA/p; Andrew VK1NAM/p; Ed VK2JI/p; Colin VK3UBY; Ron VK3AFW; David VK5KC; Rhett VK3GHZ; Larry VK5LY, Shaun VK5FAKV; Tim VK5AV; Mark VK1MDC; Tony VK3CAT; Andrew VK3ARR.qrp; Grent VK2MEV/qrp; Matt VK1MA; Glen VK3YY; Peter VK1IRC; Peter VK3FPSR/m’ David VK5LSB; Al VK1RX/p; Tony VK5ZAI; Mark VK3PI; Owen VK7OR; Fred VK3JM; Andy VK5LA; and Mitch VK3FMDV. Peter VK3YE/pm; Marshall VK3MRG/p; Peter VK3PF; Larry VK5LY; Andy VK5LA; Ron VK3AFW; Rhett VK3GHZ; Ed VK2JI/p; Dale VK5FSCK; Al VK1RX/p; Andrew VK1DA/p; Andrew VK1NAM/p; Michelle VK3FEAT/p; Tony VK3CAT/qrp; Matt VK1MA; Colin VK3UBY; Mark VK1MDC; Fred VK3JM; Mike VK3XL; Bernard VK3AMB/qrp; David VK5LSB; Tim VK5AV; Mark VK3PI; Grant VK3HP; Brian VK3MCD/p; Jeff VK5JK; Ivan VK5HS; Grant VK5VGC; John VK5NJ/qrp; and Greg VK2FGJW/qrp. I have posted a video on You Tube of this activation.